The difficult decision to close came after months of work on a detailed structural assessment of the building by engineering firm Dunning Thornton Consultants. The closure includes the Blessed Sacrament Chapel and Connolly Hall. 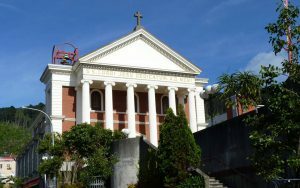 The Cathedral foyer, the chapel and Connolly Hall are part of a separate structure built in the 1980’s and are not earthquake prone. However their proximity to the main body of the Cathedral means they would potentially be affected by any damage the Cathedral might suffer in an earthquake. The engineers have proposed an interim solution which would allow the use of Connolly Hall, the Blessed Sacrament Chapel and the foyer. The cost and timeframe for this work is being ascertained. It is possible the work could be completed by the end of August 2018 which would then allow access to those areas. The Cathedral, designed by architect Francis Petre was opened in 1901. In contrast to most other Wellington churches its classical rather than Gothic styling has made it a prominent building in the Thorndon landscape. The Cathedral is one of only a few fine examples of Petre’s work still standing today. Many have found the Cathedral a place of spiritual enrichment, a place of beauty, and a place to take time out from busy city life. Its fine acoustics and organ have also provided a home to musicians and groups who have used it for concerts and recordings, and it is regularly visited by tourists. Masses: 10:30am, 7:00pm, St Mary’s College Hall, Guildford Tce (behind Cathedral). Parking is still available at the Catholic Centre carpark, and Sacred Heart Cathedral school playground as usual. Mass: 8:00am & 12:10pm Ground Floor of Viard House (Archbishop’s Residence). White Building Next to the Catholic Centre. Access via the conservatory. Mass: 8:30am Ground Floor of Viard House (Archbishop’s Residence). White Building Next to the Catholic Centre. Access via the conservatory.